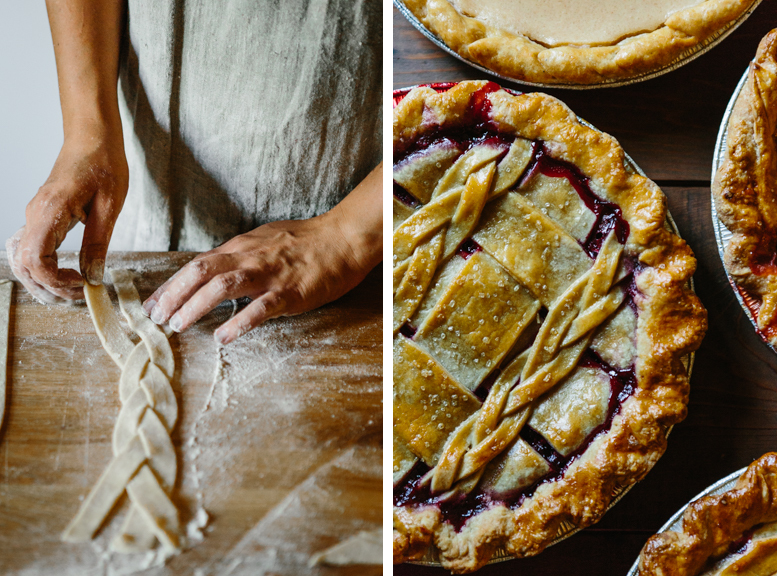 I spent a couple of dreamy August days with Demetria and her partner Justin last summer, while she was in the thick of producing an impressive number of gorgeous, creative pies for farmers market season. Living on Lopez Island, a place with a strong seasonal shift in visitors and residents between summer and winter, her summers tend to be busy and focused on the many details around pies. Winters find her engaged with photography, illustration, chocolate-making, and recovery from her busy season. She has also launched a super dreamy-sounding creative residency. Check it out! Largely I make pies, chocolates, and moon calendars for a living. I also do a bit of freelance photography and illustration work on the side and I’m currently working on a magic/feminist/witchy zine with another woman here on the island, as well as carving out a small artist residency space within the baking studio. How did you come into the work that you do now? I grew up baking, most of my favorite memories are in my grandmother’s kitchen, or curled up drinking hot chocolate in front of her wood stove. Some other family members also blame it on the Greek genes, as my yia-yia, her mother, and so on - loved to bake. So much of the work I do now has been a slow narrowing down of what I feel truly passionate about. In college I would put off my homework by making bread, experimenting with different flavors, making my own sourdough – until finally I transferred to study baking at a college up north in New England. Here it seemed natural to pick up photography--photographing the baked things I made in school, as well as the people I met along the way. After college, I moved to Brooklyn, working with food photographers, landing a spot in editorial with Saveur Magazine, and getting my dream job of making pies at Four & Twenty Blackbirds. 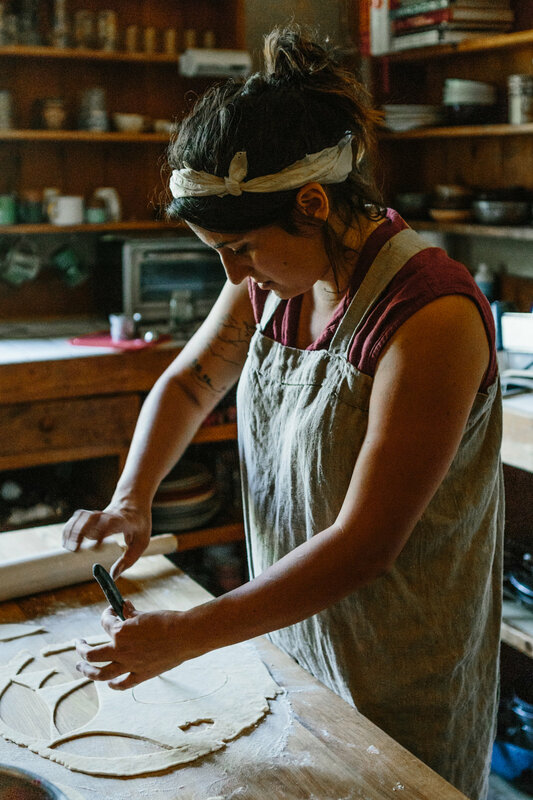 I loved all of the work I was able to do in New York City but would often dream of living remotely, specifically a rustic spot in the woods, a place reminiscent of my grandmother’s, but in the foggy, misty landscape of the PNW I had fallen in love with during my first baking apprenticeship in British Columbia. Many of my days at work I would dream about the work I’m doing now. And after about 2 years of being in the city I more or less just put a finger on the map, wrote offering to help out at the local bakery, and found my way out to the little island off the coast of Washington that I live on now. After a lot of scrambling, housesitting, and being a general nuisance to my friends - I found a small studio, tucked back in the woods (decidedly more rustic than I had dreamed), met my now-fiancé, and started up my little business – Woodland Keep. Here there is very little work and I was nearly forced into building up this little pie business in order to make ends meet – a business I started with only $400 to my name. Hopefully amongst this there is a larger inspiring message of follow your intuition, and if you’re unhappy change something -- but even as I’m writing this I’m surprised and humbled as to how this whole story has unfolded. What are the biggest challenges of your work? While it was so liberating and peaceful to work by myself at the beginning, as the business grows, doing it alone can be a challenge. There is so much more to being a small business than you see – answering e-mails, costing (an art I still haven’t mastered), marketing, taxes, the ever pervading thought that you could be doing more, working more efficiently, going to more markets, picking up wholesale clients, and then the constant comparison game- you are in charge of everything and sometimes this means shutting off the voice in your head and just going for a walk, seeking balance, remembering why you love this work in the first place. I think for many creative folks it can feel stifling and challenging to commodify the things they love and then sort of be a puppet to that moneymaking paradigm. It can be a challenge not to mold your business to what you think it’s “supposed to look like” and make your own way. There is so much to think about when you aren’t just clocking in and out every day. What are the biggest misconceptions about what you do? I think one misconception is that people assume that everything about this work is super dreamy– which it is, most of the time. But I think this can feel unfair because it is also a lot of hard work -- a lot of early mornings and late nights with little pay-out. As the islands largely run on a tourist economy, the summer - one of the nicest times to be here - feels like one long, blurry memory: setting up for market, breaking down for market, making special orders, and then doing it all over again. I love it, and I love being busy, especially now because I so appreciate the quiet and peace of the winter, but that doesn’t mean there also weren’t a few small breakdowns in between. I think also because you can buy $6 pie from the grocery store (usually made with Crisco and other weird ingredients) many people still don’t really understand the value and time that goes into something handmade with locally sourced ingredients, and then the additional cost of using all organic ingredients. Have you found that being a woman impacts your experience in your industry? The only times I really concretely notice this are at the farmer’s market. This could be because I could get better with asserting and marketing my own things, but I’ve noticed people respond better to my partner Justin when talking about prices. Sometimes people will balk at me when I mention prices (“could you make it a little less organic”) but this rarely happens to him. Find more of Demetria's work here. And follow along with her creative adventures on Instagram!